A trip to Indonesia proves to be a harrowing episode for Devanshi Mody who enjoys the country despite mishaps galore…. Bali is a resort bazaar. “It’s where people spend lots of money to do little,” someone says at the St. Regis which Saudi Arabia’s king famously booked to leave half-empty, stashing his retinue at lesser resorts commensurate with their hierarchy. But there’s more to Indonesia than Bali. And more to the destination than sybaritic profligacies I discover when inopportune occurrences catapult me out of luxury, into misadventure, tossing me about some of Indonesia’s scatter of 17,500 emerald-forested islands. In beleaguerment, I call my editor Adrian Bridge at The Telegraph (UK). “Devanshi, I thought you’d be writing great literature by now. Why are you doing this?” he asks. “Adrian, clearly, I’m a masochist,” I say. But there’s pleasure in masochism and if not ‘great literature’ then a good story in misadventure. And if not that even, then at least I can say with Shakespeare that what follows is a ‘….tale…. Told by an idiot, full of sound and fury signifying nothing’. Bali. A relentless throb of jagged-edged temples of architectural monotony. Balinese Hinduism is ritualistic and simplistic. Yet, the Balinese grasp the recondite monotheistic quintessence underlying Hinduism, ‘Many manifestations, one Divinity’, from which the mighty pantheon of Hindu gods has proliferated. Moreover, it is about the caste-transcending equality of beings that our butler and chauffeur from Alila Villas Uluwatu converse about while escorting us to the 11th-century Uluwatu Temple. The monument is no architectural marvel, but is enchantingly hill-perched amidst dramatic blue seas. “Nature is the temple,” Mum remarks, admiring the discipline of Balinese pilgrims as we descend the temple’s steps lined by trees whose tops merge like praying hands. Bali. Its ‘spirituality’ has been extolled to the point of banality. Lindsay Kinniburgh at Ayana Resort says Bali’s ‘life-transforming’ spirituality is so formidable she has witnessed men make rain vanish. After navigating Ayana’s 19 F&B options, I enquire hopefully if those warlocks can also make fat vanish…. Bali. It’s where, Kinniburgh observes, “Traffic lights are a suggestion rather than a regulation.” It’s where a motorbike crashes into you because the driver is smoking while driving or a bike trudging at 10 kilometres an hour stalls you and your chauffeur; when asked to overtake, he regards you with bewildered incomprehension: “Overtake?” Balinese shiftlessness and cerebral inertia exasperate, particularly the anguished Japanese management with their brisk exactitude at newly-launched Hoshinoya. All that invigorates Bali is the ‘Chinese circus’. Certain resort lobbies, Ricky Utomo of the Bvlgari Resort chuckles, “are like a midnight sale” pulsating with Chinese tourists in voluble haberdashery, high-heeled, almost reeling into lotus ponds they hazard selfies on. The Bvlgari, whose imperious walls and august prices discourage the Chinese, say they had to terminate afternoon tea packages (another Balinese phenomenon) — can’t have Chinese tourists assail their precipiced parapets for selfies. The Chinese wed in Bali. Indians honeymoon there. That said, the isle inspires little romance. In the Viceroy’s gazebo, overlooking Ubud’s verdure, a honeymooning Indian girl, exuding from her décolleté, contuses her anatomy à la Bollywood starlet, but her husband keeps romancing his iPhone while a Chinese man bandies a soft toy to entertain his wife who shuts tight her eyes in disdain as Mum watches on in wonderment. When untoward circumstances remove us to remote and neglected West Bali National Park, where alone on the island you spot deer, two varieties, extraordinarily drinking salt water, we stumble upon Bali’s most enthralling hideaway and meet Bali’s savviest man, general manager Gusti at Plataran Menjangan (an eco-luxury resort in a destination unbothered about the environment). Time on our mobiles bestrides Bali-time and Java-time as we behold Java and Menjangan Island beyond and mangrove-frilled waters below and Gusti discloses he forsook a glamorous resort that evinced he’d never be GM because only expats could hold the post at Bali’s luxury resorts! He’s now intent on making a destination of this distant idyll attained after a five-hour scenic drive past coffee and clove plantations, over hills and around lakes. 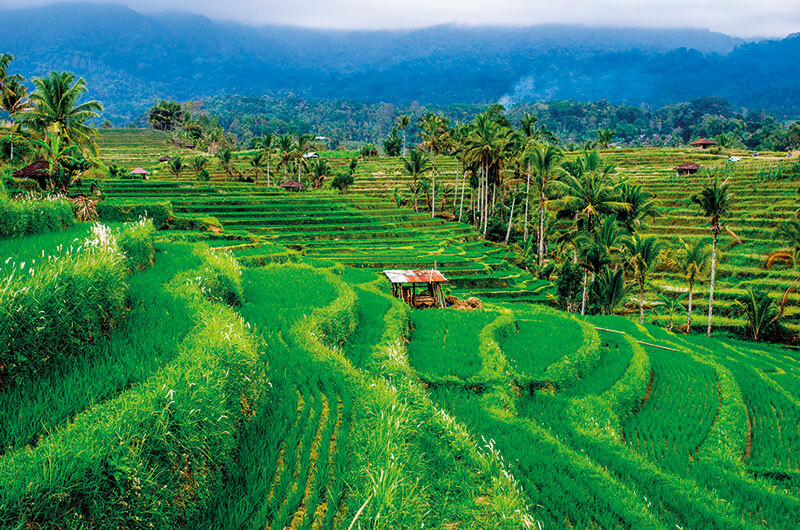 Driving back we detour via the UNESCO World Heritage site Jatiluwih, whorls of vibrant cascading rice terraces more spectacular in reality than in pictures, and the sea-temple Tanah Lot, more enticing in pictures than in reality. The driver, anxious for his own rice bowl, quickens us through Jatiluwih, lingering instead at Tanah Lot that is streaming with Chinese tourists in boots and coats (in 45 degrees Celsius). Bali’s temples, including UNESCO-listed Pura Taman Ayun, are impressive but not impelling. 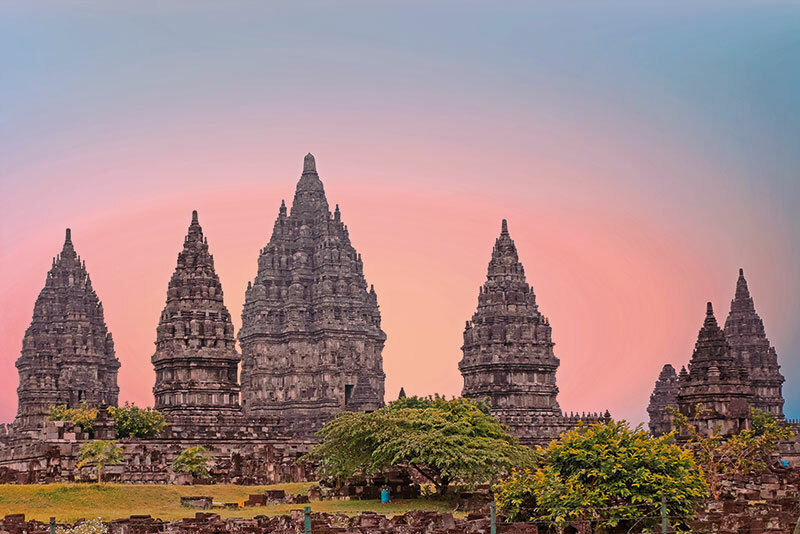 The magnificent sculpted monoliths of dragons, snakes and buffalo at 9th-century Tirta Empul water temple and the fabled Besakih’s ultimate hilltop shrine, however, amaze. It also astonishes that we were on Mt Agung visiting Besakih, Bali’s most sacred temple, days before it erupted and we’re still in disbelief that on an otherwise disaster-riddled odyssey we were spared an erupting volcano. Misadventure lands us in Flores. From the plane, bestrewn islands boiling out of a sprawl of blue look like enormous wallowing hippos. Hours before arrival we don’t have accommodation, until Puri Komodo Resort is chanced upon, which doesn’t intimate they’ve no telephone or Wi-Fi, charming, except when you’ve got to book onward accommodation, flights and a boat to the UNESCO-designated Komodo National Park. At the Labuan Bajo airport I’d spotted the new Alba Cruise Flores, sole operator offering daily excursions, but calling them requires a 40-minute boat ride in high tide back to Labuan Bajo for five minutes of puttering WhatsApp and 40 minutes to return to Puri Komodo in a thunderstorm: our speedboat bores through a tunnel of darkness coruscating spasmodically with a witch’s finger of lightening; the sea rises like wild galloping horses, whipping manes of waves, as rain lashes down viciously. The next morning, the sun is blazing. The Alba Cruise boat, its engine making cauliflowers of water erupt, trailing a bridal veil of froth, speeds past islands where mangroves bunch like broccoli. 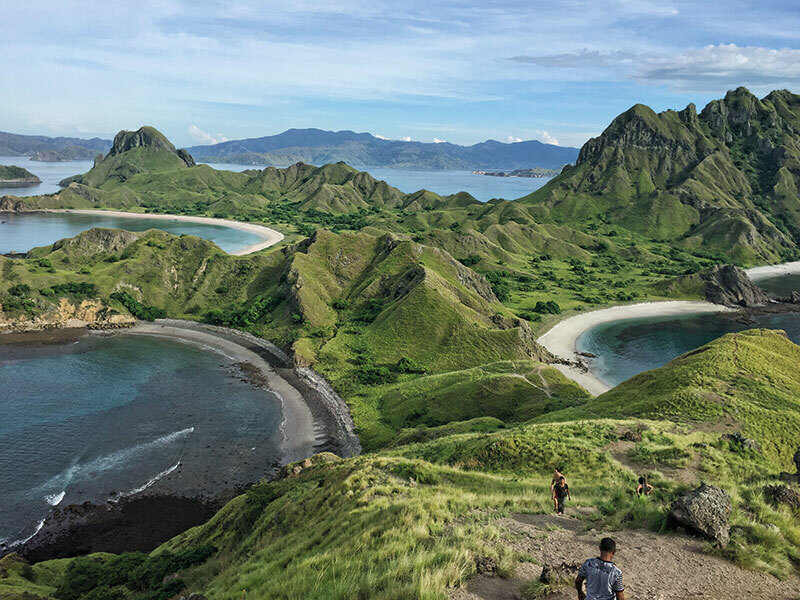 We’re early and alone (before other cruises clutter) on Padar Island whose summit gives tremendous prospects over pink, black, white, ash and jade beaches ‘crescented’ like chokers around islands that white lace carpets of waves slowly unfurl onto. Then to see Komodo dragons, not quite the miniature dinosaurs expected, but don’t go trekking alone for a Singaporean recently succumbed to a Komodo attack. I’m embarking on the ‘Long Trek’ through the picturesque park, but other travellers won’t brook delays and demand refunds and then tarry to take a million photos of komodos and one billion selfies (in toilets too). At Manta Point we see mantas evanesce into sharp blue waters. Post cruise, our spry guide Gonzales offers a snake-tracking jungle expedition. Alas, another thunderstorm churns the skies. 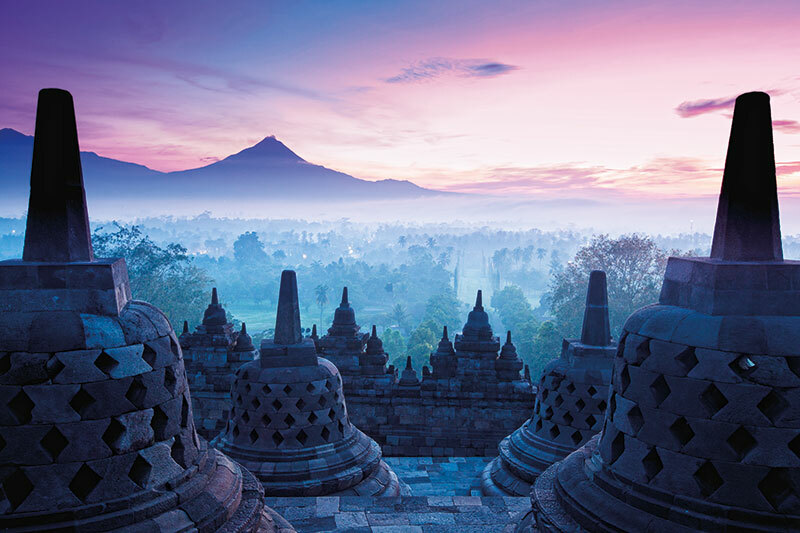 In remorseless rain, in the cultural capital Yogyakarta, in central Java, we visit the 9th-century UNESCO sites Borobudur and Prambanan. And discover Remote Lands whose name suggests they’ve less imbecilic guides. Especially as our guide Sutan is one of the only four that Remote Lands recruited from 150 applicants. My mother mistakenly calls him Sultan and he quips, “If my name were Sultan I wouldn’t be here,” as he fetches us from our 100-year-old heritage hotel, The Phoenix Hotel Yogyakarta. He imparts that Yogyakarta’s present sultan, whom Obama recently visited when holidaying in Indonesia, has no male heir but won’t take another wife (although his father had five wives and 32 children), thereby endearing himself to Indonesian women. “It’s all about the women,” Sutan reiterates at Prambanan as he deciphers depictions from Ramayana, Sugreeva combating Bali to recuperate his wife. Prambanan and Borobudur’s expansive sculpting was effected by artists from Tamil Nadu and Odisha, Sutan says, and that Borobudur’s concealed lower panel with illustrations of deviant sexuality are seen in Dutch books only, as the Dutch alone accessed this gallery during colonial rule when they decapitated Buddhas and threw tea parties on the temple’s pinnacle. Sutan likes guiding Indians, as few other tourists are interested in the cultural intricacies of the sculpted reams wrapping the monument. 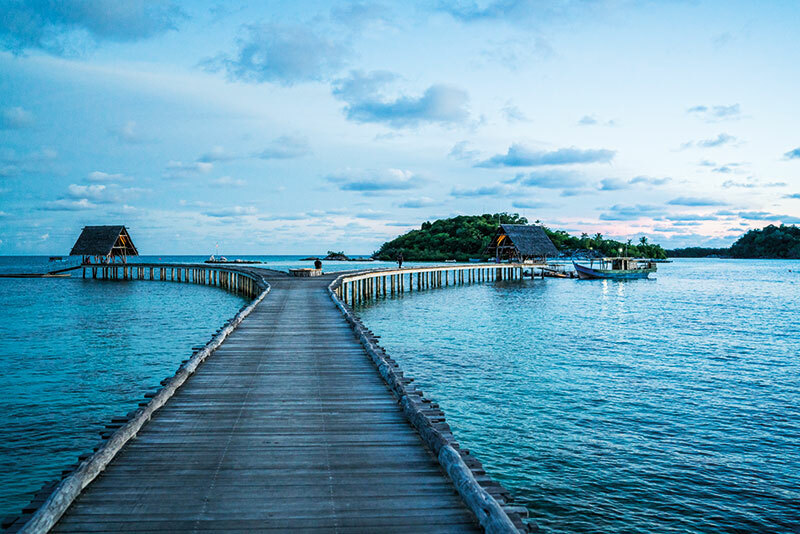 Misery persists when we near-miss connections from Yogyakarta to Singapore and a boat to reach the hitherto uninhabited island Bawah in far-flung Indonesia. Bawah is supposedly a time machine and it certainly throws me back to my childhood and I feel as if I am in some Enid Blyton adventure when on a trek around the island — we hike up the hill, down to Coconut Beach and then we’re wading through waters with coral shards that stingrays shimmer past, scouring mangroves to spot mud-skippers or scampering up rocks where grand monitor lizards patter away. We emerge where baby sharks swirl. You may picnic on different islands contouring Bawah, but despite eco-oriented Bawah’s exertions, rubbish from elsewhere scars white beaches, where 2,000-year-old cicadas endure, and it dismays when callow staff lay a picnic, from plastic boxes, in an encirclement of plastic refuse. Great literature doesn’t just tell a pretty story but takes you out of complacence. Likewise, if thinking is the greatest luxury, then a good luxury holiday should make you see not just pretty sights, but with the mind’s eye.